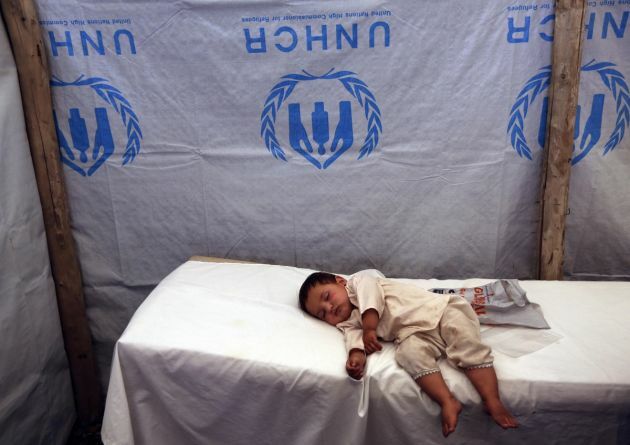 (Photo: Reuters / Omar Sobhani)An Afghan child, who is a refugee, sleeps on a bed during a registration process at an United Nations High Commissioner for Refugees (UNHCR) camp on the outskirts of Kabul June 20, 2013. Pope Francis has condemned as a "brutal act" the massive suicide bomb that tore through a busy neighborhood in Kabul, killing at least 90 people and the head of the World Council of Churches has denounced the deed while warning against countering every act of violence with violence. A suicide attacker detonated a bomb hidden inside a tanker truck close to the heavily protected diplomatic area during the morning rush hour on May 31 leaving some 400 people injured by the blast, which left a deep crater, the BBC reported. In a telegram signed by Cardinal Secretary of State Pietro Parolin, the Pope expressed his condolences to all those affected by the bombing. "Having learned with sadness of the abhorrent attack in Kabul and of the many dead and seriously injured, Pope Francis expresses his heartfelt condolences to all affected by this brutal act of violence," said Francis. The pontiff offered his prayers for the victims and for peace in the country. At the same World Council of Churches general secretary, Rev. Olav Fykse Tveit, reached out with condolences and prayers to those who have lost loved ones due to senseless violence. "I condemn this attack as a cruel act against innocent people. We stand with you in shock, in prayer, in sadness," said Tveit, "and we appeal for peace during a time when so many are hit by this type of violence." The blast came only days after the start of the Muslim holy month of Ramadan. "This attack comes at a holy time for many, during a month that people observe with fasting, prayers, and good deeds," Tveit. "The need for unity, the need for peace grows more urgent every day. We must walk toward justice and peace together." "What if we counter every act of violence with correspondingly larger acts of unity and love?" he asked. The United Nations Security Council and U.N. Secretary-General Antonio Guterres strongly condemned the "terrorist attack" in Kabul and demanded that those responsible be brought to justice, The Associated Press reported. The council called it a "heinous and cowardly" attack and reaffirmed "that terrorism in all its forms and manifestations constitutes one of the most serious threats to international peace and security." The U.N.'s most powerful body urged all countries to cooperate with the Afghan government in identifying and prosecuting the perpetrators. Guterres' spokesman spokesman Stephane Dujarric said the secretary-general "expressed his abhorrence at this act and underlined the need to reinforce the fight against terrorism and violent extremism."